Today from prison at Fort Monroe, Virginia, former Confederate President Jefferson Davis writes General Nelson A. Miles, the prison commandant. He requests permission to write his wife, obtain fresh clothes and reading materials, and receive a visit from the prison chaplain. He also inquires if his guard detail might be downsized. Davis’ treatment is a source of concern for former Confederate leaders, while United States officials are more focused on bringing justice to bear for late president Abraham Lincoln‘s assassination. 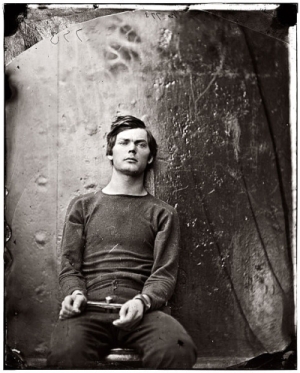 John Wilkes Booth, the killer, died in a shootout in May. But the eight others (one of whom, Lewis Powell, pretended to be a Baptist minister) implicated as co-conspirators are yet alive, and today they are found guilty by a military tribunal. Their sentencing varies from death (including Powell) to a six-year prison term in one instance, sentences that effect some sense of public justice. But in 1869, at a time when U.S. President Andrew Johnson is increasingly seeking to mollify the bitterness of Southern whites over the freedom granted slaves, the four surviving prisoners are pardoned by the president. While Davis seeks better prison treatment and the Lincoln co-conspirators hope to escape death convictions, more former Confederate soldiers take the Oath of Allegiance to the United States. Among those so doing this day is William Madison Teague (1823-1899), a private in Company G, 26th Regiment, North Carolina. Captured in a hospital during the fall of Richmond on April 3, Teague from prison in Newport News, Virginia pledges his loyalty to the U.S. and is released. Following his release, Teague returns to North Carolina, where the Rocky River Baptist Church Chatham County becomes his home church.